Nothing can ruin an RV trip faster than a break-in. If you’ve ever fallen prey to thieves, you know that it can be a painful and emotional experience. Luckily there are some steps you can take to reduce your chances of having your RV broken into. How Do You Secure and RV or Tiny Home from Thieves? Park in a good area. How to Lock a Trailer So It Can't Be Stolen? How to Find My Stolen RV? When it comes to securing your RV or tiny home there isn’t just one step you can take to make everything safe. In fact, even if you do everything right you may still end up being the victim of a break-in. However, just taking a few safety precautions can dramatically reduce your chances of being broken into. Upgrading your RVs locks and security systems, parking in the right places, and making thieves believe that someone is inside can go a long way towards helping you secure your RV. Adding a tracking system for quick recovery of your RV and removing your valuables each time you leave can reduce the amount of theft that occurs even if you are broken into. If all else fails, you can always financially secure your RV through a good insurance policy. The first idea is exclusively for RVs. The rest are for tiny houses as well. Where you park your RV is often the biggest determining factor of whether or not it will be broken into. I’ve lived in neighborhoods where criminals would routinely check car doors just to see if they were locked. One mistake and you’d end up losing whatever you left inside your vehicle that day. In another neighborhood I lived in, I typically left my work laptop in the back seat of my vehicle and even forgot to roll up the windows from time to time. When you’re traveling, you may not know what type of neighborhood you’re in. For this reason, it’s always best to park in a well-lit area with other people nearby. Professionally managed campgrounds and patrolled state and national parks are almost always safer than free parking areas like rest stops and business parking lots. In fact, before stopping at a Walmart for the night, you may want to go on websites like Spot Crime or Trulia to see what the crime is like in that area. Walmart is often at the center of criminal activity in a neighborhood so if the neighborhood has a high amount of crime you can bet that the Walmart parking lot will have a lot of criminal activity. We suggest you always do this in your tiny house. Leaving a light on in an RV will signal to criminals that someone is in the RV. This won’t stop criminals who wish to do harm to others but it can deter theft. 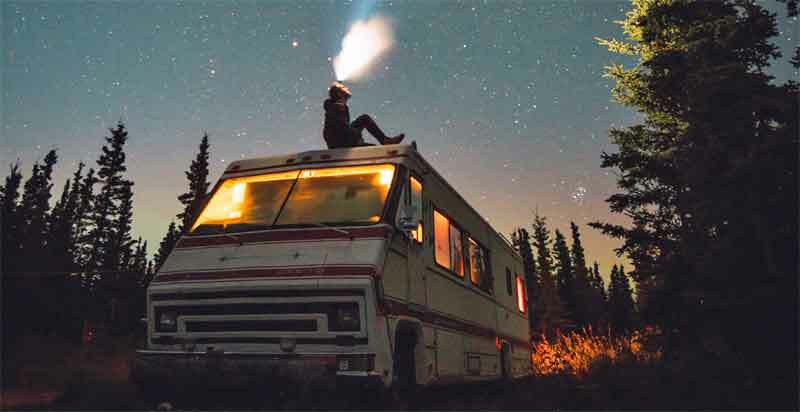 You can leave a light on in the inside of your RV and you can leave a light on outside of it as well. In fact, you can even install solar flood lights near your front door that will turn on when someone gets near. A solar flood light will even protect you as you approach your RV because you’ll know whether or not someone is waiting for you by your front door. You can also install a timer to turn your bedlight on and off during the night time. This is a great options for tiny houses as well as RVs. Be careful about leaving interior lights on for extended periods of time. Your RV’s lights run off of your battery and if you’re not plugged into the grid you may run your battery down. Turn a talk radio program on and passers-by will think that people are inside talking to each other. The radio doesn’t have to be very large and you can even buy a battery powered one so that you don’t have to worry about running your RV’s battery down. If you want to be really clever, record yourself having a conversation with someone and play it over the radio. This will ensure that your ruse isn’t discovered during the talk-radio shows commercial breaks. Most people know that they can upgrade their door and window locks but they often forget that these aren’t the only locks campers need to worry about. A towable RV owner doesn’t have to just worry about the inside of the RV being broken into, they also have to worry that someone might steal their entire RV. Adding locks to the hitch as well as the trailer wheels will increase the chances that your RV will still be in place when you get back to it. These locks can be as simple as a combination lock added to the hitch or as sophisticated as actual wheel boots that ensure that the trailer cannot move at all. Just because a criminal has gotten into your RV doesn’t mean they need to leave with all of your possessions. If you’re going out for a while, you may find that the easiest way to secure your valuables is to take them with you. Why leave your wallet or watch behind when you can just as easily take them with you? For larger items like laptops and tablets, buy a safe and bolt it down into the frame of your RV. A bolted down safe can’t be walked away with and the additional security may keep the criminal from gaining access to the items inside. Buy a waterproof and fireproof safe and you have an added layer of protection for your valuable items that may come in handy even if you aren’t on the receiving end of a crime. This is a must if you live in a tiny house. A security system can consist of many different variables. You can buy motion sensing alarms, door alarms, window alarms, security cameras, and even devices that let you project your voice to your RV. Use motion sensors, door alarms, and window alarms to scare away would-be criminals and to alert you of their presence. Add in security cameras to alert you of criminal activity and to help catch any criminals that have managed to get away with some of your belongings. I’d recommend that you at least get some security cameras for the exterior of your RV. These cameras do not cost much and will not add much weight to your RV. Additionally, the footage they capture can even help you in the event of an auto accident. Add a GPS tracking system to your RV and you’ll easily be able to track it down even after it’s been stolen. Companies with fleet vehicles have been using these systems to track their vehicles for years and they’ve become incredibly accurate. A side benefit of having a GPS tracking system added to your RV is that you’ll never have to worry about forgetting where you’ve parked. If you aren’t sure what street you parked on, just pull out your cell phone and access your GPS tracking software and it will tell you exactly where to go. One of the best ways to secure your RV is to camp with others who can watch it while you’re away. This is especially true for people who will be doing remote camping or boondocking with their RV. Bringing others along with you provides many added benefits as well. In addition to the extra security camping with others provides, you also have someone near you in case other emergencies arise. Also, camping with others is often more fun than camping alone. If you’re having trouble finding others to camp with you, consider joining a local meetup group or other camping specific organization. Doing this will help you find others to camp with and may even lead to you meeting new friends. A good insurance plan can’t keep you from being burglarized. What it can do, however, is it can help protect you from the negative financial impact that comes with being burglarized. An umbrella policy can be used to protect the belongings inside of your RV and RV and trailer insurance can help protect your actual RV. RV insurance policies are not very expensive and you may be able to fully cover your RV for the entire year for just a few hundred dollars. If your RV is an older model it may cost you even less than that. How to Lock a Trailer So It Can’t Be Stolen? The most effective way of locking a trailer so it can’t be stolen is to add a hub lock to the wheels. This will keep the wheels from turning which makes it impossible to tow the trailer. Unless you can physically lift the trailer, you won’t even be able to load it onto a flatbed truck. The first step you should take towards finding a stolen RV is to contact your local authorities. Give them the make and model of your RV as well as the license plate numbers. Also, give them a detailed description of the RV so that they’ll be able to easily identify it by sight.